Tainan is not only famous as a historical site but also well known for its good food in Taiwan. Many delicious food in Taiwan actually originate from Tainan. We have a LONG list of food to try out within just one day in Tainan. Besides the famous Dan Zai Noodles, we had tons of Tainan’s specialties like Milkfish Porridge, Coffin Toast, Eel Noodles, Calamari Rice Noodle Soup and more! And whats more, we’ll bring you to the biggest night market in the southern Taiwan with nearly 400 stalls! Our original plan was to spend a night in Tainan before travelling back to Taipei. However, we were pressed for time and staying a night in Tainan meant that we would not have enough time in Taipei. As such, we thought that it would be a better idea to start the next day early in Taipei. Hence, we decided to make Tainan a day trip and end our day in Taipei. If you do not have time constraints like us, it is highly recommended to spend at least one night in Tainan when you visit. On day 5, we woke up super early to catch the earliest HSR from Taichung to Tainan. From Beacon Hotel, the staff there had kindly helped us to call a cab to Taichung HSR station, which is around 15 minutes away. Our train was at 6:25 a.m but when we got there a bit too early. The Taichung HSR station only opens from 6 a.m to 12 a.m. For those of you who would like to buy HSR tickets, my advice is to get them as early as you can! There’s early bird discount for Taiwan HSR tickets, with limited quantities only. There’s a maximum of 35% discount off the usual ticket prices. The tickets with early bird discount to popular destinations like Taichung and Taipei can be sold out pretty fast. Remember, the earlier you buy the more discount you may get! Nowadays, it is really convenient to purchase and use the HSR tickets. We booked the HSR tickets through the “T-Express” mobile app (available in English) and paid for the trips using credit card. After the payment, we received the QR codes for our trips on the app. All we need to do before boarding the HSR was to scan the QR code of the trip from the app at the gantry. No printing is required. Since we weren’t staying in Tainan, we left our luggage at the lockers at Tainan HSR Station. There are four big lockers available. If I’m not mistaken, the size of the big lockers is around 41.5cm x 86cm x 58cm, which is big enough to fit a large luggage. Our driver for the day in Tainan, Sophia (苏小姐) picked us up at the Tainan HSR station. We engaged Sophia from a highly rated chauffeur service in Tainan, called 阿果阿貓台南包車旅遊 (Yago and Chin). We came across with their Facebook Page and were surprised to see that they actually have a rating of 5.0 based on more than hundreds of reviews. Here are the fees for their services (in Chinese) for different destinations in Taiwan. I’m not sure if English speaking drivers are available, you may check with them if you need one. Our first stop in Tainan, the super famous breakfast place in Tainan – Ah Tang Salty Porridge (阿堂咸粥). I have personally seen this on TV shows and I was happy to say that their standard definitely lives up their name. The signature Milkfish Belly Porridge (虱目魚肚粥) here is absolutely delicious and so is the pan fried Milkfish Belly! Make sure you don’t miss out this place when you’re visiting Tainan. After we had the Milkfish Belly Porridge at Ah Tang Salty Porridge, we moved on to the next door – Bao Cheng Mutton (包成羊肉) for the part 2 of our breakfast. This place wasn’t on our food list initially, but our driver Sophia, who is a local in Tainan, recommended us to try it as it is a popular stall in Tainan. Mutton soup is a popular choice for breakfast for the locals in Tainan. Even though we are not a big fan of mutton, but we still found the mutton soup pretty comforting and it’s something different from what we usually eat. The mutton soup was topped with a lot of ginger slices, and we were told that we could ask for more if that wasn’t enough. Besides that, there was this special sweet sauce and ginger slices were served together with the soup. The mutton was tender and the soup was pretty comforting. But I guess I would still prefer a savoury sauce instead of a sweet one. After almost exploding our stomach, Sophia brought us to the Chihkan Tower for a tour. Chikan Tower (赤崁樓) , also known as Fort Provintia is a landmark of Tainan City. This place was built by the Dutch in 1653 during their occupation back then. The entrance fee for Chikan Tower is NT$50 per person. Here’s a photo that Sophia took of us at Chihkan Tower. The Chihkan Tower is one of the most popular historical sites in Tainan. Our driver Sophia explained to us some of the stories behind the place while we took a stroll in the garden and the hall. If you’re interested in learning the history of Tainan, this is the place you want to be. There are stories you can read about how the hero of Taiwan, Zheng Chenggong (koxinga) attacked and forced the Dutch to surrender. 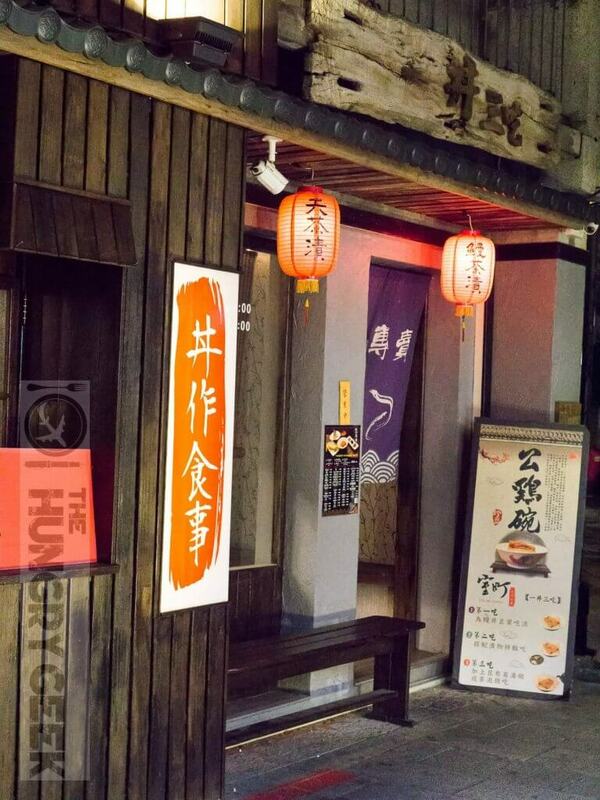 Hanlin Tea Room (翰林茶館) is a famous chain bubble tea store that originates from Tainan. Like Chun Shui Tang from Taichung, Hanlin Tea Room also serves both drinks and food at their stores. We went to the Hanlin Tea Room outlet near Chihkan Tower to try out their bubble tea. Both the founders of Chun Shui Tang and Hanlin Tea Room claim to be the inventors of bubble tea. Even until today, the exact birthplace of the Taiwanese drink is still in dispute. Whoever invented the bubble milk tea, you are genius! I love both renditions of the drinks with tapioca balls (a.k.a pearls). We tried the signature Panda Bubble Milk Tea at Hanlin Tea Room and I love it! It is different from the normal bubble tea, Hanlin Tea Room’s signature drink has both black and white pearls in it. I’m not sure what exactly the white pearls which are smaller in size are, but they do taste and look like sago. I love the mixture of both pearls with different sizes and textures, giving a different chewy sensation. A normal size of the signature Panda Bubble Milk Tea at Hanlin Tea Room costs NT$60 and a big one costs NT$75. After we left Hanlin Tea Room, Sophia brought us to the Tainan Confucius Temple (台南孔子庙). Tainan Confucius Temple is also known as Scholarly Temple. This place has more than 350 years of history and it was built by Zheng Chenggong’s son, Zheng Jing. Confucius Temple was not only a school during the past, it was also the place where the imperial examination was held. When we were there, we actually spotted some university graduates shooting their graduation photos there. David and I are normally not so into temples, so we only spent around 10 minutes there before we started to feel bored. Tainan Fuzhong Street (台南府中街) is located just right across the road from Confucius Temple. After we entered the street through Pao Gao Stone Arch, we saw some handicraft stalls by the two sides of the street. The street was so quiet and I could barely see any visitors around. I guess we were a bit too early and many stalls and shops were not opened yet. Fuzhong Street is a street full of arts, crafts and snacks. This place is supposed to be bustling and a perfect place for visitors to experience the culture of Taiwan. But unfortunately, we just came at the wrong time. From Fuzhong Street, Sophia drove us for around 6 minutes to our next stop – National Immigration Office (台南移民署). Yes, it’s the immigration office that’s handling the immigration affairs in Tainan. This Barouque-styled building has to be one of the most beautiful government buildings that I’ve ever seen. The National Immigration Office building is extremely photogenic. Visitors flock to this place to take photos with the blue/white castle-like building. Do pay this beautiful immigration office a visit when you’re in Tainan, you won’t regret it. We have never really felt hungry throughout the day in Tainan. Not only do we have a long list of famous food to try out, our driver, Sophia has kindly helped us to add more and more food to our visit list. Before we visited Tainan, we did not hear of Yeh’s Calamari Rice Noodle Soup (葉家小卷米粉). In fact, we have never heard nor seen any Calamari Rice Noodle Soup before! Sophia recommended this small yet popular establishment to us, saying that this stall is really famous in Taiwan. Indeed, the moment we stepped into the place, we saw a lot of photographs of famous celebrities on the wall. A lot of famous stars from Taiwan and Hong Kong have visited the stall, and this even includes superstars like Jackie Wu and Jay Chou. One bowl of the Calamari Rice Noodle Soup only costs NT$90. Look at the amount of the calamari in just one serving, it was so generous! The calamari was tender and chewy, and the rice noodle was smooth as well. A piping hot serving of calamari rice noodle is really comforting and I can understand why the locals love to eat this. It is so light and comfortable such that you won’t really get tired of it even if you eat if frequently. Since David and I were still full, we only ordered one serving to share among us. You may try out the Calamari Rice Noodle Soup if you have time in Tainan. But if you’re in a rush and have a long list of food to try (just like us), you may find this too plain to be slotted into your packed food trip in Tainan. Yongle market (永樂市場) is a popular local market where both locals and tourists love to visit. There are A LOT of Tainan specialties in Yongle Market. The market is always so crowded and packed with patrons who are here for the yummy goodies. We saw many stalls with long queues that we would really love to try. Unfortunately we could only stuff that much of food into our stomach in one day. If you’re here on an empty stomach, do try out the Tainan’s specialties like rice cakes, meat buns, oyster omelette, spring rolls and more. There’s this famous BBQ rice stall located right inside the Yongle Market – Yongle BBQ Rice (永樂燒肉飯). This is a very popular stall here and I have read about this on some Taiwanese websites. There were queues lining up in front of the stall and most of them were ordering their signature dish – BBQ Pork Rice. There is always a big crowd during lunch hours here. Not only is the BBQ Rice delicious, the price is pretty affordable as well. A set of BBQ Pork Rice comes with salad and soup, costs only NT$65. The BBQ pork looks so tempting and you will be pleasantly surprised by the taste, which is very different from the appearance. There was this very familiar taste outburst from the first bite, and we actually took pretty long to figure out that distinct taste. This is Bak kwa! We thought that the BBQ pork would be savoury but it was actually sweet, and tasted exactly like Bak Kwa. If we had never tasted Bak Kwa before, we would really find this dish delicious. But I guess we were too spoilt by the high standard of Bak Kwa in Singapore, so this dish lost a bit of luster once we related it to Bak Kwa. Nonetheless, at the very least you must buy one bowl and share it amongst your group! Before we stuffed more food into our belly, we decided to take a stroll to help digest the food we had previously. We asked Sophia to bring us to Tainan Shennong Street (神農街). Even though she said that most of the shops don’t open until afternoon but we still decided to spend some time here. Shennong Street is known to be more beautiful at night, so if you don’t have much time to spare, do visit this street after the sun goes down. As expected, Shennong Street was quiet at noon. Many shops weren’t opened by then. You can easily notice that Shennong Street has a unique vintage feel yet it also has a bit of a hipster vibe. The street is filled with art galleries, cafes, fashion boutiques and more. There are quite a few old streets in Taiwan, but there’s none like Shennong Street. The beauty of Shennong Street is that most of the shop lots here are left intact giving a special charm like no other. By taking a stroll on an old street like this, I felt like I have been transported back to the 60s. A lot of photographers were attracted to this street to capture the vintage feeling out of it. This is a perfect place in Tainan to have a look on the ancient architecture of the past. If you have time to spare and engaged a driver for the day, you may visit the street by the day and night to experience the different auras of Shennong Street. Aranzi Cafe is one of the few places which are opened before noon at Shennong Street. We decided to spend some time here to have a drink and stay out of the hot sun. Aranzi Cafe is a themed cafe where a lot of cute decorations of the characters from Aranzi Aronzo can be seen here. Thankfully the cafe was not too busy during our visit. We ordered drinks and spent some quality time at the cafe. Aside from the cafe, they have a B&B here as well. If you’re interested in staying right within the beautiful Shennong Street, you may check out their website below for more information. Next up, we are going to eat again! This is one of the MUST EAT in Tainan – Du Xiao Yue (度小月). Tainan Du Xiao Yue has over 100 years of history and they are the reason why Dan Zai Noodles (担仔面) is famous in Tainan. Du Xiao Yue is very famous in Taiwan for their signature Dan Zai Noodle. Even though there are branches across Taiwan, but how can you visit Tainan without trying out the Dan Zai Noodle at their original store? The handmade noodles are springy and the meat was flavourful. But the true essence of the bowl of noodle actually comes from the soup based prepared with shrimp head. David thinks that this is a recipe frozen in time, perhaps being unchanged over the past few centuries. Make sure you have this one on your food list when you visit Tainan! Our next stop is within the Anping area. There are several attractions in this area like Anping Old Street, Anping Tree House and Anping Old Fort. These places are all within walking distance. We could easily spend two hours just exploring this area. We started from Anping Old Street/Yanping Street (安平老街), where you can find traditional folk games, temple, traditional houses, desserts and of course, street food! Anping Old Street is an old place in Tainan but injected with new blood. There are a lot of traditional houses and shop lots lying around as well as some old school games and food. There are also a lot of new eateries along the busy Anping Old Street. The afternoons at Anping Old Street are always busy and lively. There are a lot of food stalls along the streets and you can never get enough of the street snacks and drinks. Even though Anping Old Street can be pretty touristy, but the prices of the food and drinks are still reasonable. There are so many traditional folk games and old school food around here. I couldn’t help to stop and watch the kids playing the games and indulging in the fun! We know that there’s a famous Anping Bean Jelly lying around here. But before we could find that shop, we went into a random bean jelly shop to eat and rest for a bit. But it was pretty average. The Chou’s Shrimp Rolls at Anping Old Street is pretty famous as well. But as there was a long queue and we weren’t hungry then, we didn’t try that out. Please let us know how it tastes if you ever visit them! The oldest fortress in Taiwan – Tainan Anping Old Fort (安平古堡) is just within walking distance from Anping Old Street. Anping Old Fort is also known as Fort Zeelandia. It was a fortress built from 1624 to 1634, over the span of 10 years. The entrance fee is $NT50 per person. The small museum at Anping Old Fort tells the history during the time of the Dutch arrival, the Zheng Chenggong’s (Koxinga) invasion and the Dutch’s surrender. The famous Anping Tree House (安平樹屋) used to be the warehouse of the Tait & Company merchant house (德記洋行). It has become one of the landmarks in Tainan City as the giant banyan trees slowly grew all over the abandoned building. Similar to the Anping Old Fort, the entrance fee for Anping Tree House also costs NT$50 per person. It is pretty amazing that a banyan tree can literally swallow the whole house over the years. The house is giving out a creepy vibe but thankfully there are a lot of visitors around so it wasn’t scary at all. The branches and roots of the banyan tree can be seen all over the place at the tree house. There were a few viewing platforms to see the tree up close. There’s a branch of the famous Tongji Anping Bean Jelly (同記安平豆花) located along An Bei Road, which is in between of Anping Tree House and Anping Old Fort. Bean Jelly, or more commonly known as Tau Hway (豆花)/ Tofu Pudding. There are several branches across Tainan and Kaoshiung. We visited their second branch because it was near to the Anping Tree House. Besides the traditional bean jelly, Tongji Anping Bean Jelly also serves shaved ice and taro balls (Fen Yuan). There are many different flavours and toppings to choose from. Tongji has been using the traditional method to prepare their bean jelly. We ordered the popular beancurd with a mixture of small pearls (Fen Yuan) and beans. The bean jelly is smooth and not too sweet, I love the combination of beancurd, red beans and fen yuan. A cold serving of this in the hot weather was so soothing and comforting. I almost finished the whole serving all by myself. From Anping, we moved further north to Beimen area. Our next stop is Beimen Visitor Center (北門遊客中心). It took around 45 minutes to travel from Anping to Beimen. As you can see in the pictures, there are a lot of beautiful murals and decorations for photo opportunities. If you’re not in a rush, you may enter the visitor center, which is a tiny museum. We didn’t enter the visitor center due to time constraints. Instead, we decided to take some photos outside the center. There are a lot of nicely painted walls and decorations around the visitor center. This area in Beimen district was designed as a beautiful landscape for pre-wedding photo shootings. Girls who like taking photographs can easily spend an hour or so in this area and immerse in the beauty of the art pieces. Besides the famous Beimen Crystal Church nearby, there’s also a tiny transparent church-like building at Beimen Visitor Center. If you’re like me, and you have watched the famous Taiwanese drama – The Prince Who Turns Into a Frog (王子变青蛙), you will surely find this old convenience store familiar. Even though this drama aired more than 10 years ago, I could still remember the story line and this convenience store. I loved this Romance Comedy so much back then. The convenience store “Money Coming (钱来也)” played an important role in that drama. This place was one of my must-visit places in Tainan. It was so nostalgic and brought back a lot of memories when the drama was broadcast years ago. Unfortunately, the convenience store is now emptied. Previously, this was an actual old convenience store with various old school snacks and toys. A few hundred meters away from Beimen Visitor Center, there is a beautiful church called Beimen Crystal Church (北門水晶教堂). Aside from Beimen Visitor Center, Beimen Crystal Church is also a perfect spot for pre-wedding photos. Due to a viral post of the church on the internet when it just opened, waves of visitors flocked to the area and caused a significant amount of damage that required repairs. To prevent things like this from happening again, the public is strictly allowed to take photos outside of the fences only unless you have an application for a wedding. Beimen area is located at the west coast of Taiwan and that made it perfect for sunset viewing. The Jingzaijiao Tile-paved Salt Fields (井仔腳瓦盤鹽田) with heaps of salt piles and the neat square tiles made the sunset in Beimen like no other. Jingzaijiao Salt Fields is only 7 mins drive away from Beimen Crystal Church. If you’re coming to Tainan, do plan a trip up to Beimen area in the late afternoon to witness the sunset at Jingzaijiao Salt Fields. The thin layer of seawater at the salt field throws a perfect reflection of the sun and the orange sky. Every evening, you will see groups of photographers gather around here for a perfect sunset shot. After viewing the beautiful sunset at Jingzaijiao, we left Beimen and came back to Tainan City. Sophia sent us to Chihkan Coffin Bread (赤崁棺材板) to try out one of the most famous Tainan specialty – Coffin Bread (棺材板). Chihkan Coffin Bread has one of the best coffin breads in Tainan. The coffin bread does resemble the shape of a coffin but the name of the food sounds really inauspicious. Actually, the Chinese name of the food “棺材板” carries the meaning of “getting promotion and becoming rich” (升官发财). The coffin bread actually tastes like a seafood chowder, but chicken was used here instead of seafood. The thin layer of bread is crispy and matches really well with the sweet cream sauce. We also tried another of Tainan’s specialties – Eel Fried Noodles (鳝鱼伊面) here. According to Sophia, there’s another restaurant near Chihkan Coffin Toast that sells better Eel Fried Noodle. But due to time constraints, we decided to try this dish at Chihkan Coffin Toast instead. We are not really a big fan of the stir fried eel here as it was a bit tougher than the usual eel that we had at Japanese restaurants. But their fried noodle deserves a good thumbs up! Apparently the fried noodles here are hand made and it tastes so much better than the ones we eat normally. If you’re keen on bringing some home, the fried noodles are up for sale in packets too. Next up, we went down to the biggest night market in the south of Taiwan – Flower Night Market(花園夜市). We’ll dedicate a separate post for the food we had here, so please look forward to it! After the food spree at the Tainan Flower Night Market, we went back to the Shennong Street once again. This time, we came back for the sake of the night view of the street. The street was not as busy as I thought it would be, but the vibe was totally different from the day. With most of the Chinese lanterns lighten up, we felt as if we were walking on a street in a period drama. I love how the old street was all dressed up for the night and giving the unique ancient vibe. There are some restaurants and small bars open at night. If you’re staying somewhere near here, please do not hesitate to come by for a meal or a drink and soak up this unique old street in Tainan. If time permits, you may take a stroll from Shennong Street to Haianlu Art Street (Haian Road) to check out some art pieces as well. We then headed to the Tainan HSR station to collect our luggage and took the HSR straight to Taipei. To be honest, we were almost half dead when we reached our hotel in Taipei. My advice is, please at least stay one night in Tainan! Our day in Tainan is pretty packed and you really don’t want to rush like us. We wouldn’t have been able to finish our itinerary of the day like this without the help from our driver, Sophia. She was very helpful in many ways and we are really grateful that she gave us so many suggestions of Tainan’s awesome food and attractions. Sophia is extremely familiar with Tainan and we have heard so many interesting stories from her about Tainan. You may contact their Facebook Page to engage their service. That’s all for our day in Tainan. For the next day, we are in Taipei where we will be featuring Yong He Soy Milk, Yehliu Geopark, Jingtong Train Station, Shifen, Nanya Peculiar Stone, Yinyang Sea, Jiufen and Raohe Night Market.